Shawn Travis Kemp was born on the 26th November, 1969 in Elkhart, Indiana, USA, and is a former professional basketball player who played in the NBA league from 1989 to 2003, during which this power forward was named to the NBA All-Star team six times. 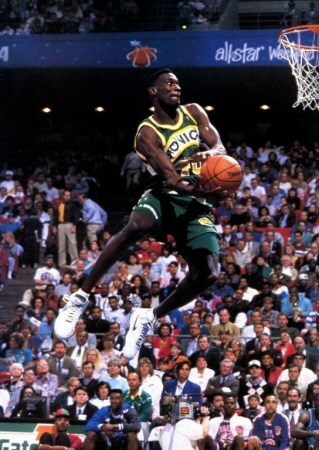 Professional sport is the main source of Shawn Kemp’s net worth. So just how rich is the sportsman? It has been reported that the current net worth of Shawn Kemp is estimated to be as much as $5 million – his highest annual salary was $14,940,000 received from the Portland Trail Blazers by Kemp. Before leaving Concord High School Elkhart, Shawn Kemp was named to the McDonald’s All-American High School Team, and then enrolled at the University of Kentucky, but was almost immediately excluded for disciplinary reasons. 19 years old and without having played any college game, Kemp declared himself for the 1989 NBA draft, and fortunately the Seattle Supersonics selected him in the 17th position. For his first season, when he was the youngest player in the NBA, Kemp played less than 14 minutes but managed to make 6.5 points and took 4.3 rebounds on average. During his second year, the departure of Xavier McDaniel to the Phoenix Suns opened a more important place for Kemp in a team, and although an injury caused him to miss 18 games, his ability continued to make an impression. Often relegated to the role of the sixth man, Kemp managed to score an average of 15.5 points, and 10.4 rebounds. The 1992 play-offs gave him an opportunity to present himself as one of the sensations of the league, and he was selected for the All-Star Game, becoming the first player from Seattle since Dale Ellis in 1989. The 1993-1994 season allowed Kemp to prove he was one of the best players in the league despite his young age, and was selected in the US team for the FIBA World Championships in Toronto, where they won the gold medal. Shawn Kemp realized his best season in 1995-1996 in a team that would be called the “Sonic Boom” having 64 wins against just 18 losses. However, after the following season Kemp was part of a round of trades that saw him with the Cleveland Cavaliers. During his first season with the Cavaliers, Kemp did not drop scheme and led the team with averages of 18 points and 9.3 rebounds per game. He also became the first player from Cleveland to take part in an All-Star Game in which he scored 12 points, took 11 rebounds and realized 3 steals. However, weight problems meant that he was never considered to be at his best, and in August 2000, he was the subject of a new exchange and landed in the Portland Trailblazers, however, after two average seasons interspersed by alcohol and cocaine problems, Kemp lost his contract. Kemp launched a final challenge by signing with the Orlando Magic as a free agent. Alongside Tracy McGrady, Kemp participated in 79 games, scoring on average 6.8 points and 5.7 rebounds, and racking-up his 1000th NBA game, but he retired at the end of the season. In late 2005, Shawn declared that he wanted to return to competition and had been training, losing nearly 15 kilos. Despite rumors, no NBA club wanted to sign a contract with him, so finally, Kemp signed with the Italian club Sutor Basket Montegranaro, and at 38 the player returned to basketball. He participated in the preparation matches, but on the 29th September 2008, the Italian club decided to break the contract of Shawn Kemp, as he decided to return to Houston to inspect his house after Hurricane Ike. One week before the start of the championship, the club could not afford to wait for a player who could not provide the date of his return to Italy. In the rather spectacular personal life of Shawn Kemp, he has fathered eleven children with ten different women. He has also had continuing problems with addictions, and has been charged for drug possession several times.